The Loki (Clan designation Hellbringer) is a Clan fire support and electronic warfare Heavy Mech. It's also among the only non-light Mechs equipped with C3 and nearly each variant comes with an impressive array of various additional equipment. Typical Loki variants mount multiple weapon types ranging from CGausss to Mguns. Its greatest weakness is its lack of armor, which is on a level of medium mech; a Loki can't stand up to sustained fire for long. The Loki Prime is an excellent hide-and-seek Mech. Equipped with GECM and BAP, it is capable of detecting enemies far before they have any chance to spot it, and with its C3 system, it is capable of relaying target data to nearby allies, making the Prime a powerful electronics warfare unit. At 900 meters its pair of CERPPCs can deal some serious damage, and its three CERMBL and CSSRM6 give it supplementary firepower as enemies close the distance. A pair of MGuns and single B-Pod allow the Prime to hunt Battle Armor. With its all-range weaponry and plethora of electronics, the Loki Prime makes an excellent platform for hunting LRM campers and Long Toms. Missiles take longer to lock on a GECM-equipped Mech, and an artillery piece would never see it coming. The Loki's A variant is a general mid- to long-range support unit. While it carries far less in the way of electronics compared to the Prime, it carries a wide breadth of weaponry to make up for this. For combating enemy units at maximum range, the Loki A carries a pair of CERLBL supplemented by a single CLRM15 for additional damage. For additional damage, this variant also carries a pair of CUAC5s, though these are less effective at dealing burst damage compared to the lasers and missiles. However, these can be paired up with the dual MGuns to be used in BA hunting and, when crouched, allow the Loki A to act somewhat as an AA platform. The Loki B is a long range support Mech, designed to stay right behind the heavy support units. Its primary firepower comes from the CGauss, capable of delivering a powerful blow to enemies at range. In addition, it carries dual CLPL and twin ATM3s for additional long-range firepower and limited AA capabilities. Best used as a relatively quickly moving long range harasser, pilots should reposition before return fire can penetrate the Loki's relatively thin armor. The C variant is a departure from previous variants in that it focuses purely on close-range brawling rather than ranged warfare. It achieves this through a CLBX20 and a CLBX10, which, when combined, can deliver incredibly powerful blows at close-range, with a pair of clan medium pulse lasers and an ATM6 (HE) giving supplemental firepower. The Loki C also carries only 1 free ton for additional ammunition, typically used for the CLBX20 to give it somewhat adequate time in the battle zone. However, the Loki C can be seen as somewhat lackluster in the role of outright brawling because, like all Loki variants, the C does not carry enough armor for extended engagements, and certainly not enough to stand up against the firepower it is likely to face when facing enemies up close. Thus, hit and run tactics are best used against similarly sized but often heavier armored opponents. The Loki D is a quick hitting close-range support unit. This variant is also equipped with AECM allowing it to protect nearby friendly units. It also has LAMS to lessen the threat of incoming missiles as well as an extra ton of armor compared to the other Loki variants. Unlike the C, the D is equipped primarily with close-range weapons. Its repertoire consists of a singular CDSSRM6 and quad CHML. These lasers are capable of dealing great damage if they can be kept on a specific component of the enemy unit during their firing duration. The mech also has MASC to sprint at the cost of generating heat. Even with 9 DHS, the mech struggles to manage its heat, especially when using MASC. Additionally, the Loki D carries a pair of Flamers for protection against Battle Armor and to make other mechs feel toasty. Stay close and use your superior speed to rush in unexpectedly, while providing cover to your friends with AECM. 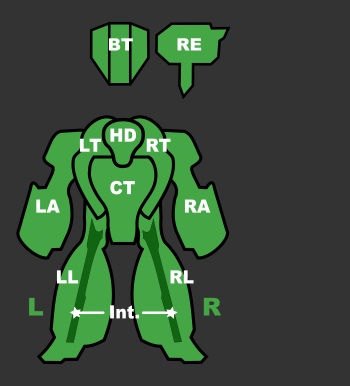 When fighting this mech, keep it isolated if possible, as its armor is not strong enough to last long, and its effective range is quite short. Consider grouping the heavy medium lasers in two groups to better manage their massive heat spikes. A brawler with some added reach, the Loki E snubs the AECM found on the previous brawling Loki variants in favor of sustained close-range firepower. A pair of CUAC10s allow it to barrage enemy units with AC fire and deal plenty of damage even from a distance. This variant also has twin CERMBLs and single streak 6 pack short range missile launcher for supplementary firepower, and also carries a pair of MGuns for protection from BA attacks. While the Loki E does not carry AECM for allied support, it at least has GECM to protect itself from enemy radar detection. Pilots of the Loki E would still do well to stay near allied units, as the Loki E does not have the armor to withstand engagements with enemy units of a similar weight-class on its own. This Loki is a cooler-running and cheaper alternative to the fantastically expensive Prime loadout. The F drops one CERPPC and some of its electronics in favor of a pair of CLRM10 racks and three additional clan extended range medium beam lasers. Both MGs are removed to provide more double heat sinks, 11 in total, providing the dissipation necessary to run this 'Mech to its limit. B-Pod helps dealing with enemy Battle Armor These changes move the Loki F into a fire support-based role and away from a pure sniper setup. Unfortunately, it shares the same relatively fragile armor as the prime and thus, this 'Mech should attempt to stay behind the cover of front-line mechs and its own GECM, providing detailed tactical information via its C3 radar to allies. With no spare tonnage for reloads, the Loki F will be forced to retreat for reloads during extended deployment in a long-ranged capacity. Another medium to long range variant, the G's twin CLBX10s, dual CERMBLs and potent ATM9 (ER) launcher enable it to soften up land targets or air assets at range. Further long range harassment is done by 3 machine guns. Only one spare ton of ammo typically used for the ATM9 launcher is available, allowing this mech to shoot its LBXs dry too quickly. Lacking heavy hitting weaponry and any protective electronic equipment, this inexpensive Loki is best kept around allies, scanning the sky for air assets to shoot down. The Loki was an unannounced Mech released with 0.3.0, though one of the development team members leaked the information about it to the community some time before its implementation. No press releases appeared about this Mech before the final release, unlike the other new units. Known to its Clan Hell's Horses creators as the Hellbringer, this Mech has been described in the Inner Sphere as "an utterly mad configuration". Most commonly used in Clan Jade Falcon, the Loki is an electronic marvel equipped for long-range or antipersonnel combat. Its primary configuration mounts two CERPPC, three CERMBL, two Anti-Personnel pods on each leg, an AMS system, and an impressive set of electronic equipment including Guardian ECM, a Beagle Active Probe, and three tons of Targeting Computers. 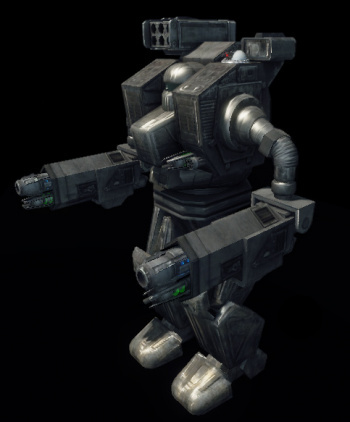 This 65 ton OmniMech could be seen in all types of missions except reconnaissance.